EJOLT partner OCMAL (Observatorio de Conflictos Mineros en América Latina) asks for definitive suspension of the Conga mining project in Cajamarca, Peru. OCMAL is a regional center with a history of observing mining conflicts in Latin America (http://www.conflictosmineros.net/). 1.- César Padilla, spokeperson for OCMAL, released a statement on 5th December 2011, the day after the state of emergency was declared in Cajamarca by the president of Peru, and the province was taken over by the police and the military. 2.- The statement retraced the history of socio-environmental damage to the local communities by the Yanacocha gold mining company (owned by the Newmont and Buenaventura companies, and by the IFC of the World Bank). Land grabbing and water pollution had been constant for many years. The damage done by the mercury spill in Choropampa had not been compensated for. Yanacocha only understood resistance. It was popular resistance and the mediation offered by the environmental justice organisation Grufides led by Marco Arana, that some years ago stopped plans for mining in the water-rich Quilish mountain overlooking the city of Cajamarca. 3.- OCMAL’s statement explained the likely consequences of the additional 4600 million USD project being planned by Yanacocha for open cast gold mining in Conga, that would drain lakes at 4000 m high. The EIA of this project was faulty, as the Ministry of the Environment has recognized. The regional government of Cajamarca declared a civic general strike against this project at the end of November of 2011. The government of President Humala was divided on the issue, the vice-minister of Environment, Jose de Echave, resigned, asking for the Conga mining project to be stopped while the EIA was revised. 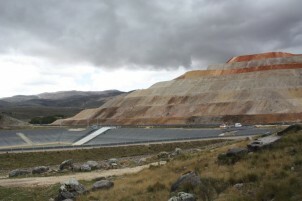 The Yanacocha mining company was insisting on carrying out the project. Faced with civic protests, the government had declared a state of emergency banning public meetings and strikes in Cajamarca. 4.- The prime minister of Peru, Salomon Lerner, resigned over this issue on 10th December 2011. President Humala has named a new premier, Oscar Valdés, a retired colonel of the Army and entrepreneur. Commentators in Peru see this as turning away from genuine dialogue with communities negatively impacted by mining all over the country. Primer Minister Valdes has called for an international revision of the original Conga EIA but there are no news yet of who would be in charge of such revision. 6.- EJOLT cooperates with OCMAL and its director Cesar Padilla in collecting statistics and mapping mining conflicts in Latin America. The EJOLT project will run from 2011 to 2015.